I’ve been following news about King’s Square, and writing about it every now and then, since last summer, and thought it would be useful to collect together all the information on one page. The changes planned for King’s Square and other parts of the city are part of ‘Reinvigorate York’ (summary here) (City of York Council). It’s essentially a modernisation programme. York is viewed as in competition with other cities, and a critical eye has been cast over its ‘clutter’. 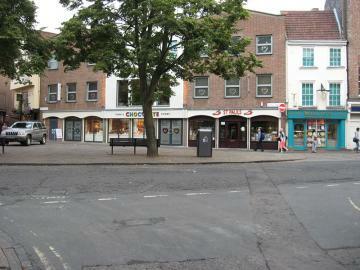 Last summer the visitor attraction Chocolate Story put in a planning application for cafe seating in King’s Square. This was strongly opposed. The application for cafe seating was withdrawn by Chocolate Story before it was due to be decided. 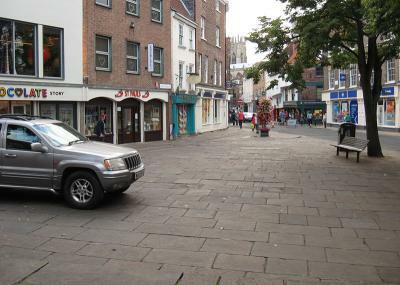 In February 2013 City of York council held a consultation on the proposed changes to King’s Square. One of the questions was about whether we were in favour of cafe tables in the square (see above). The information was widely available and comments could be made in a variety of ways. Just under 200 people sent in comments. After the consultation, council voted to approve the scheme, in a meeting in April 2013. 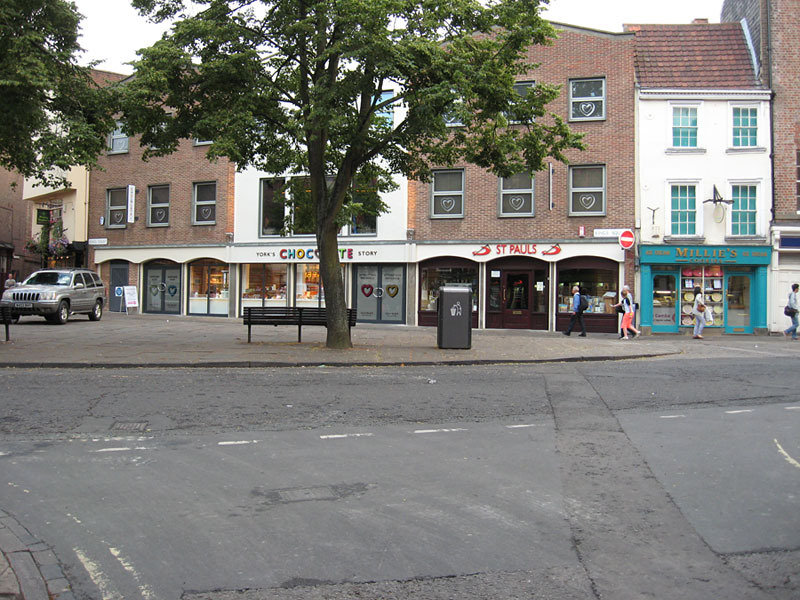 The entire area of King’s Square and the nearby tarmac roads is to be resurfaced, to make it more obviously a pedestrian-focussed area, so not so much space is taken up by road. But it has been decided that it’s not possible to extend the existing surfaces: it all needs to be replaced. According to the council, this repaving has to include removal of the curved line of cart tracks (the large rectangular blocks) with the setts (aka cobbles) between. The ‘reinvigoration’ also involves the removal of one of the trees. This is the tree nearest to the phone boxes in the corner near Tulliver’s. It was planted as a commemorative tree (in 2001) and is healthy. It is planted in a raised brick planter with a railing around. It has been decided this is ‘aesthetically displeasing’. It appears it’s not possible to move it so it will be cut down in the early spring. There are two commemorative benches in the square, with plaques. One remembering a person (dating from 2007 or soon after) and one remembering a record shop (dating from 1970). The benches are to be replaced with benches of a standard design. There’s no plan to keep the plaques. The council seemed unaware of the existence of one of them. Which says a lot. City of York Streetscape Strategy and Guidance Consultation Draft (May 2013) (City of York Council) gives an indication of how much work has been done on analysing our city’s streets, protecting their historic features and planning for future work. Recommended, an interesting read. Several PDFs including two main reports. It’s also important to note that the ‘Reinvigorate’ programme was inspired by the York: New City Beautiful report/vision. More on New City Beautiful (CoYC) It was intended ‘to help York to step up its game’. 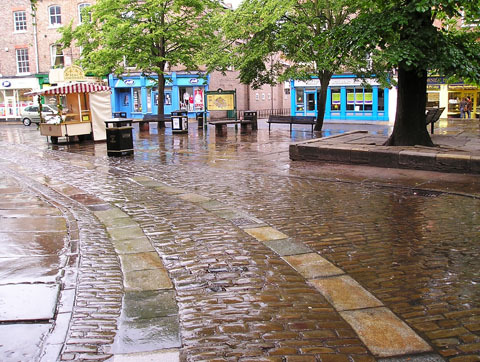 Petition launched over King’s Square cobbles in The Press. With quotes from this website. Which is nice. The above is intended to be factual and useful. Please pass on the link. If you think I’ve missed anything or if you think any of the above is factually incorrect, please add a comment or use the contact link to email me. When ‘Reinvigorate York’ has turned this square into a bland featureless any-city type place it’s moving on elsewhere to do similar in other parts of York, so look out for that. Several updates were added to the text above in October 2014, to reflect the fact that the plans changed. For more information, and other recent news, see all pages on King’s Square. « Who was Paul Woosey?